DETROIT (AP) -- Kung Fu Panda, The Freak, The Beard and all their seed-throwing buddies are on top of baseball - again. 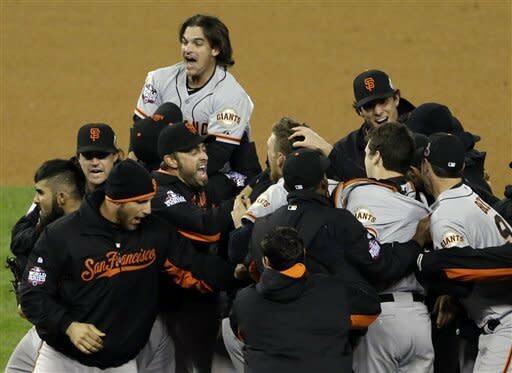 ''Our guys had a date with destiny,'' Giants general manager Brian Sabean said. 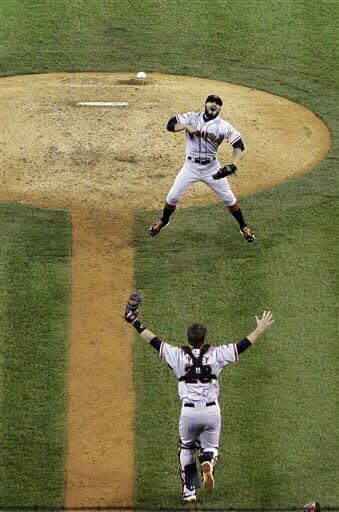 ''World Series champions!'' hollered outfielder Hunter Pence, who started the pregame seed-tossing ritual. ''You just don't get to write your own script,'' Fielder said. Sandoval said ''heart'' was the critical ingredient. NOTES: Detroit 2B Omar Infante broke his left hand when he was hit by a pitch from Casilla in the ninth. ... Ann Romney, wife of Republican presidential candidate Mitt Romney, was at the game. ... In addition to the bat Sandoval used for his first two homers in the opener, the Hall of Fame received Ryan Vogelsong's jersey from his Game 3 win, Bochy's warm-up jacket, Gregor Blanco's glove, Pence's bat - named ''Tim'' - Scutaro's spikes, Brandon Crawford's cap and Matt Cain's spikes.